Ok, so many of you are probably already aware that when you create a model in Arcgis in order to batch it you need to make the variables lists. However, there are sometimes that this just fails and it not allows you to batch your model. I encountered this problem working with a quite complicated model and looking for different solutions I figured out this one. You can just create a script instead of a model, but if you don’t have time or you are not a super scripting nerd 😀 there is another way to make it work. Is actually quite similar to the way you do macros in IDRISI. Let’s say you create your model and you want to batch process it. 1.Open the command line either in Arcmap or Arccatalog. To make sure that your model works well before you create your workflow in Excel, enter the parameters of your model in the command line and run it. 2. 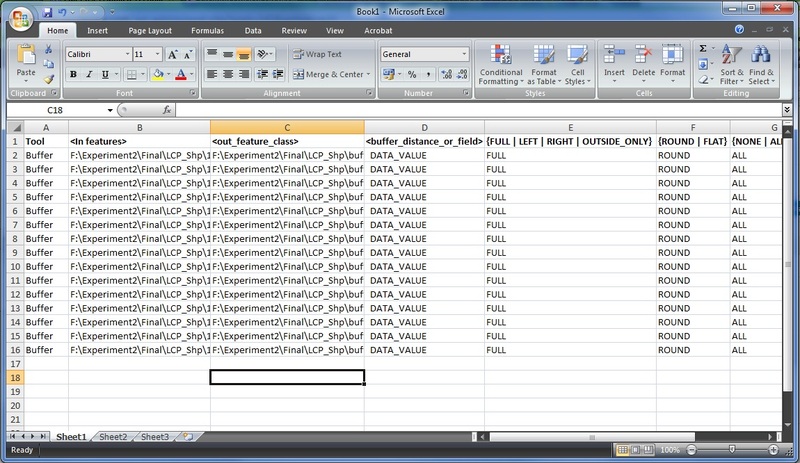 Once you are sure it is working properly, copy the parameters to a worksheet in excel. 3. Once in excel you can just drag down the values filling up the parameters, modifying the names of the files you want to run in subsequent models. 4. Delete all the other sheets in the book (Sheet1,2 and so on TAB/right click/delete). Save as .cvs (Comma delimited). 5. Open it your word processor, click Find and Replace. Replace “,” for one space. 7. Open it in Notepad. You can do the same with more complex models, just add the parameters that are necessary in your model.